Questions, ideas, and comments always welcome. What are you waiting for? BC Transit is working on the Local Area Transit plan for Jubilee area. You can look at it here. The Bike To Work Society offers a variety of courses to help you and your family feel more confident riding on urban streets. Check out their website for courses. A 4 storey 35 unit strata Commercial/residential building is being proposed for 1908/1912/1916/1920 Oak Bay Avenue. This is the space currently occupied by Gardenworks, The FrameUp and Balam's plumbing. The team from Jawl Residential will be making this presentation. This is the official community association land use meeting that occurs prior to the developer applying to the City for a development permit. Please come out and voice your opinion on this project. Comments from this meeting are forwarded by the South Jubilee CALUC(Community Association Land Use Committee) to the City planning department. UPDATE March 22, 2019: Click here to read the CALUC report submitted to the City from this meeting. A new 5 storey 32 unit rental residential building is being proposed for 1906 / 1912 Duchess Street. On behalf of Cary Hayashi (0887898 BC Ltd), Tony James of KPL James Architecture Inc. would like to invite you to a presentation of the design. This is the official community association land use meeting that occurs prior to the developer applying to the City for a development permit. Please come out to look at and comment on the proposal. This is the official community meeting prior to the developer submitting an application for a permit. UPDATE: Click here to read the CALUC report submitted to the City from this meeting. Oct 25rd, 2017 - Amphion Street between Leighton Rd and Oak Bay Avenue is a popular cut through for impatient drivers who want to miss the lights at Oak Bay Avenue and Foul Bay. This week the street got some virtual boulevards. The City, in consultation with the residents of the street, has painted lines about 4 feet from the curb to simulate boulevards. 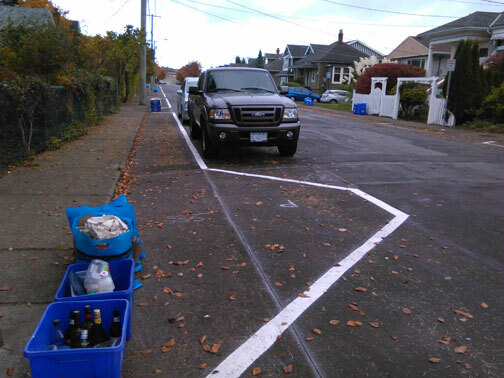 Residents are now parking at these lines rather than the curb, substantially narrowing the street. Real boulevards and a pinch point toward Oak Bay Avenue will follow in 2020. Hopefully this will slow down cut-through traffic and maybe eliminate it completely. Thanks to the City of Victoria for moving ahead on this long-standing problem. North Jubilee has received a request for a community meeting regarding a proposal at 1900 Richmond Road (corner of Fort and Richmond). The proposal is to demolish the existing Medical Centre and parking lot and to build a seniors' living home. The applicant is Maison Senior Living - Milliken Developments. All South Jubilee residents are invited to attend the meeting. Our (more or less) bimonthly meetings are held on the FIRST TUESDAY of the month. Meeting months are February, April, June, September, November. Check our recycling page for information on accepted items. If you would like to be notified when the next newsletter and the minutes from the last meeting are available on-line, please enter your email address below.